In writing about Emma Frances Dawson, I'm forced to go over ground already covered by other researchers and to write about things that have already been published. You'll find little about Emma on the Internet, and part of what you'll find is wrong. I think the straight scoop on her life and works is in a recently published annotated facsimile edition of her book An Itinerant House, and Other Stories. But because no one has written about her at length on the Internet, I'll write what I have found and hope that more will be forthcoming from my readers. Emma Frances Dawson was born in 1838 or 1839 in Bangor, Maine, to John S. Dawson, a railroad contractor, and Salome "Lola" Emerson, supposedly a distant relative of Ralph Waldo Emerson. A birth year of 1851 for Emma F. Dawson is commonly cited on the Internet, but the 1850 census confirms a birth year of either 1838 or 1839. She was an only child. By September 1861 her parents were divorced. Both remarried. Salome chose John B. Cummings, occupation unknown and ten years her junior, as her husband. In 1870 and 1880, John S. Dawson, Emma's father, was enumerated in the census with his wife, Abby. (I believe she was the former Abigail Elizabeth Averill.) By that date--1880--Salome (then calling herself Lola Emerson) and her daughter Emma had relocated to the West Coast, about as far from their birthplaces as they could go while remaining in the United States. More than one source asserts that Lola Emerson suffered from ill health. Sam Moskowitz called her "hopelessly invalid." Emma Dawson supported herself and her mother by writing and teaching music. She also wrote short stories and poems and translated works from Latin, Greek, French, German, Spanish, and Catalan. (Moskowitz included Persian in that list.) The Californian published her early story, "The Dramatic In My Destiny," in its January 1880 issue. Over the years, she penned several more stories of the weird or supernatural variety. These were collected in a book called An Itinerant House, and Other Stories in 1896. Today that book is hard to find and priced in the hundreds of dollars. That could be one of the reasons why Thomas Loring and Company of Portland, Maine, published a hardbound facsimile edition, adding three stories plus other material to the original, in 2007. The book is called An Itinerant House and Other Ghost Stories. It's edited by John Pinkney and Robert Eldridge and includes an introduction by Robert Eldridge. It also includes ten original illustrations by a fellow San Franciscan, Ernest C. Peixotto (1869-1940). Emma Frances Dawson is supposed to have been a protégé of Ambrose Bierce, despite the fact that they were roughly the same age. (She was slightly older.) Whatever their relationship, Bierce wrote of her: "She is head and shoulders above any writer on this coast with whose work I am acquainted." After her death, Helen Throop Purdy observed: "She possessed an imagination and a style that were rare, her tales often rivalling [sic] Poe's in eeriness." In 1883, she won first place in a national contest for her poem, "Old Glory." In addition to The Californian, she contributed to The Argonaut, The News Letter, The Overland Monthly, Short Stories, and The Wasp. Emma Dawson lived in the San Francisco area most of her life, initially on Russian Hill in the city, and after the earthquake and fire of 1906, in Palo Alto. She was something of a recluse and may have lived in poverty. One source suggests that she starved to death. Helen Throop Purdy reported that Emma had a stroke of paralysis and laid on the floor of her house, undiscovered, for two or three days afterwards. She was taken to the hospital and died a week later, on February 6, 1926. Emma F. Dawson would have been about eighty-six years old. Despite her obscurity and despite having written only a few fantasy stories, she is highly regarded among fantasy fans of today. I have seen two references to biographical material on Emma Dawson. First is the reprinting of her book, An Itinerant House and Other Ghosts Stores (2007). The other is The Dictionary of North American Authors Deceased Before 1950. 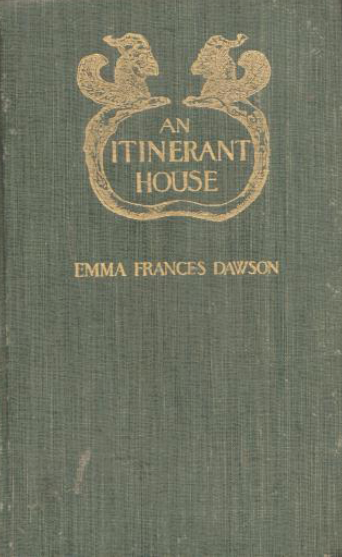 The Itinerant House, and Other Stories, in a copy from the collection of Stanford University, is available on Google Books. Update (Mar. 13, 2014): You can find an obituary, "Emma Frances Dawson," by Helen Throop Purdy, in California Historical Society Quarterly, Vol. 5, No. 1 (Mar., 1926), p. 87. Thanks to Dr. Elizabeth McCarthy of the School of English, Trinity College, Dublin, for further information. Thanks also to Richard Bleiler for sending obituaries of Emma Dawson. Hi, I am a Dawson fan, and I found the closest thing to her obituary in the March 1926 California Historical Society Quarterly. It's in JSTOR! Thanks for the link. Unfortunately I am unable to access the obituary. I hope that what I have written is borne out by that source.